Today we’re profiling Sabach Jabar Alatawnah, known as Um Atia, of PWA’s dairy! 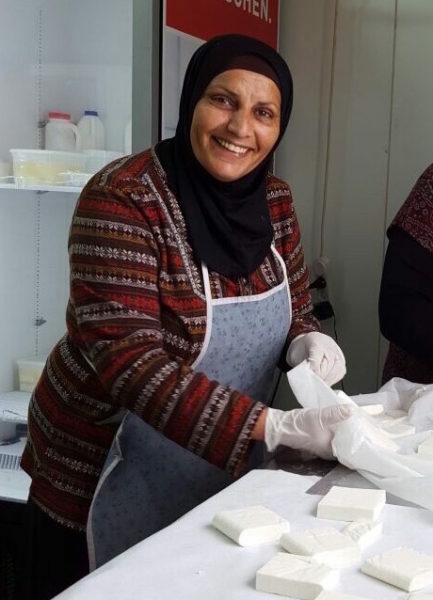 Um Atia joined Project Wadi Attir in 2015 as the first employee of the dairy, responsible for preparing cheeses and yogurt and packaging them for sale. She brings a lifetime of experience in dairy production that she learned from her mother and other elder women in her family. 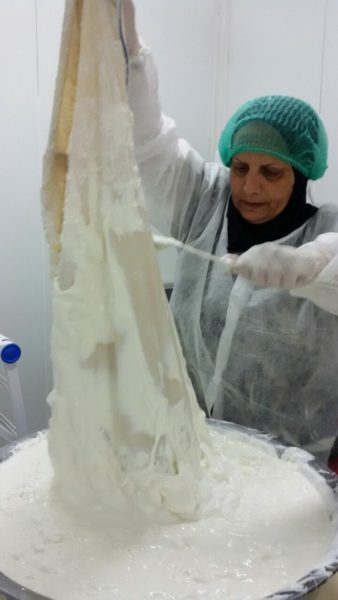 In addition to this traditional knowledge, Um Atia completed professional training, sponsored by Project Wadi Attir, where she learned about modern dairy production methods and health regulations. Even with her deep knowledge of the craft of cheese-making, she encountered many obstacles to making a living. She has no formal education, and she used to make cheese from cow’s milk—a time consuming and physically demanding endeavor. However, with perseverance, flexibility, and a strong work ethic, Um Atia has become the foundational stone of Project Wadi Attir’s dairy, shepherding it through the process of growth, which included various changes in methods, product types and tools. The dairy, not even two years old, is already locally renowned, bringing in substantial revenue in its first year in operation. Um Attia believes deeply in the concept and principles of Project Wadi Attir, and feels pride and ownership of the dairy and its accomplishments. She is role model to other Bedouin women in the community, and an inspiration to all who visit the project.